My husband & I don't have kids, just fur babies. 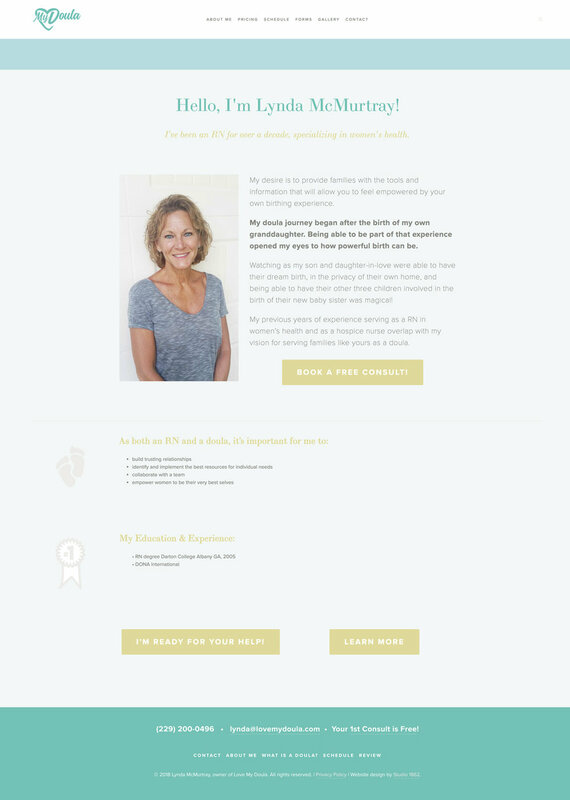 So designing a website for a Doula was a new challenge for me, but I really enjoyed it! I got to play with a bright, fun and gender neutral color palette, adorable family photos and precious stock images. Before we get started though, meet Lynda! Lynda already had a logo design before coming to me, but I came up with a bright, neutral color palette to complement the design, and some icons to add to it. A simple website for a budding business. Lynda just wanted the basics. Some pages are available in a long-scroll (index) format, while also being a separate clickable page found in the navigation. Links to the other pages are at the top & bottom navigation to make them easily accessible from anywhere within her site. With Squarespace, websites can be easily handed off and maintained by my clients after I'm done with the project. There are many things I love about Squarespace: it's intuitive & user friendly, the learning curve isn't steep, and it allows for light or heavy customization depending on the designer's skill level. Squarespace makes it easy to change out a photo, post a new blog, update content, and so much more. My clients can rest easy, knowing they can maintain their site without my help as long as they want, or I can stay on as an Admin through my own account, only accessing the backend of their site when asked. There were also 4 or 5 forms, which her clients would be filling out each time they worked with her. I redesigned the downloadable forms, giving them 'fillable' fields so they can be typed in on the computer, saved & emailed to her. Then I uploaded them to her site so they can be downloaded by anyone. I also created the same forms in an online format, so they could be submitted directly from the website without the need to download anything. 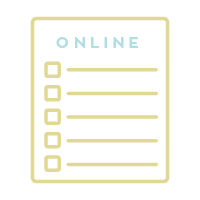 For the digital-only forms, I put all that content on the website's Forms page so they could be submitted easily online. As always, a website is perpetually in progress. Even after launching, things are changing and updating as her business grows & new needs arise. Changes should be made frequently anyway though. Google likes to see a current website! Stagnant sites won't ever grow in rankings. This is one reason I encourage my clients to keep a blog on their site! That being the case (ch-ch-ch-ch-ch-changes), I'm happy to report that a few new pages are still in the works, including a Frequently Asked Questions page! More will be added in the coming months & I can't wait to see how her business grows as a result of having a professional online home via Squarespace. If you're in need of a website, and you want the freedom of editing it as needed, I can help with that! I use Squarespace for my own website, and for my client's websites too. One of the best feelings as a business owner is having control of your website! You can edit it as often as needed, while also having the backup of the designer if you need a little help with it from time to time, without the hassle of waiting on your developer to make the changes for you. Freedom + a modern & professional look = YOUR peace of mind!